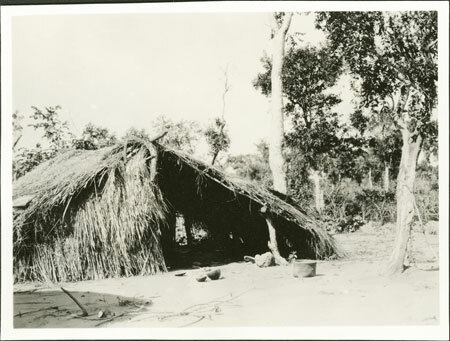 A temporary shelter (basura) built with poles and grasses for guests at a feast, consisting of two long roughed thatched sides supported on stakes and a central ridge. Notes on card mount m/s pencil - "ss 6/87"
Morton, Chris. "A shelter for a Zande feast" Southern Sudan Project (in development). 03 Jan. 2006. Pitt Rivers Museum. <http://southernsudan.prm.ox.ac.uk/details/1998.341.350.2/>.